L-R: Adeniyi Adefolake, National Treasurer, Pharmaceutical Society of Nigeria (PSN); Emeka Duru, National Secretary PSN; Ahmed Yakasai, President PSN; Osamede Uwubanmwen, General Manager, Bio-generics Nigeria Limited and Saromi John, Product Manager, after signing Memorandum of Understanding (MOU) with Bio-generics Nigeria Limited on Award for Professional Integrity for Pharmacist in public health hospitals in Nigeria, recently. To tackle the rising spate of drug and substance abuse epidemics in the country occasioned by prescription medication misuse, the Senate at a roundtable recently recommended the strengthening of Pharmacovigilance to address the menace. 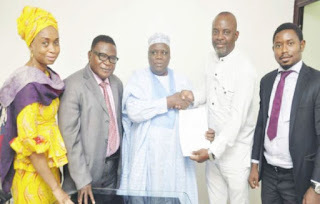 Against this backdrop, Ahmed Yakasai, President Pharmaceutical Society of Nigeria (PSN), has called for strengthening of pharmacovigilance as well as its integration into medical practice and public policy. Pharmacovigilance or drug safety is the pharmacological science relating to the collection, detection, assessment, monitoring, and prevention of adverse effects with pharmaceutical products. The National Pharmacovigilance Centre (NPC) situated in the National Agency for Food and Drug Administration and Control (NAFDAC) coordinates Pharmacovigilance activities in Nigeria. NPC serves as a repository for reported adverse drug reactions from health workers and also liaises with other international groups such as the World Health Organisation (WHO), United States Food and Drug Administration (FDA) and European Medicines Agency in improving drug safety in Nigeria. Yakasai’s call which stressed role of pharmacovigilance was contained in his presentation titled; ‘Prescription Medication Abuse – Strengthening Pharmacovigilance’ at the two-day Senate roundtable held in Kano. The PSN boss further explained that the use of medicines on such a large scale calls for a better and more efficient level of pharmacovigilance. He said, the priority areas of pharmacovigilance that need to be addressed include, improved detection and accurate diagnosis of Adverse Drug Reactions (ADRs) by healthcare providers and patients. The PSN President called for active surveillance of specific drug safety concerns through epidemiological methods such as case control studies, record linkage and epidemiological studies and indeed implementation of Information Communication Technology (ICT) based technology to facilitate surveillance. The pharmacist recommended special activities and expertise required for the detection of safety concerns related to vaccines, biologicals, veterinary medicines, herbal medicines, biotechnology products and investigational drugs. Yakasai called for improved signal detection systems by facilitating the rapid availability of ADR data that may have international relevance as well as development and implementation of ADR detection systems that could benefit populations with restricted access to health care. He said there should be assessment of ADRs through further development of automated signal detection systems used in spontaneous monitoring programmes and improvements in assessment of drug safety concerns that are of international relevance. Yakasai also called for greater collaborative links both at local and international level that could allow countries to assess and respond appropriately to drug safety crises. He recommended consideration of methods by which information on local patterns of drug use can be integrated with pharmacovigilance information during assessment of benefit and harm at a national level. In a related development, PSN signed a Memorandum of Understanding (MoU) with Bio-generics Nigeria Limited on Award for Professional Integrity for Pharmacist in public health hospitals in Nigeria on Friday, December 15, 2017. The award prize is N1million to be presented during the opening ceremony of PSN Annual National Conference. This is to encourage high ethical standard, commitment and integrity in the discharge of pharmaceutical services to the generality of Nigerian populace, as well as improving overall patient care. Osak Uwubanmwen, the Managing Director (MD)/Chief Executive Officer (CEO) Bio-generics, was represented by Osamede Uwubanmwen, his General Manager, and Saromi John, product Manager at the event. Supporting the PSN President were Emeka Duru, the National Secretary and Adeniyi Adefolake, National Treasurer. Meanwhile, the society has congratulated President Muhammadu Buhari on his 75th birthday. The PSN in a letter dated December 18, 2017 and titled, ‘Birthday Congratulations,’ noted: “On behalf of the National Executive Committee, Council and the entire members of the Pharmaceutical Society of Nigeria, I write to convey hearty congratulations to you on this occasion of your 75th birthday anniversary. “We pray Almighty God to grant you strength, good health and wisdom to continue to lead the good people of Nigeria.